Gutters that need repair and service create many problems that can damage your home and potentially affect your health. The cost to repair this damage can be expensive. Your gutters collect and carry water away from your home. They keep moisture from reaching fascia boards and causing rot and damage to your home and roof and carry collected water away from your foundation. Southern Gutter Service is dedicated to providing homeowners with functional gutters and gutter guard systems to make your gutters maintenance free and protect your home. We off a wide variety of gutter installation and repair services and will discuss all the options to best fit your home’s need as well as your budget. Give us a call for a free estimate. 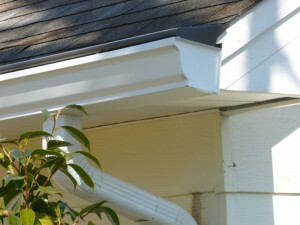 At Southern Gutter Service we install seamless gutters on all of our new gutter installation jobs. A well designed and correctly installed gutter system will drain water away from your home. Most of the gutter systems you see today are seamless gutters, the seamless design eliminates potential areas for leaks by reducing the number of joints and seams on the gutter. Without seams or cracks, a seamless gutter system is virtually leak free. When seamless gutters are correctly hung and have the correct number of downspouts they are much more efficient at keeping water off of home and directing it away from your home. In addition to seamless gutters we pay careful attention to custom leak free miters, correct end-caps and adequate downspout spacing to ensure that your new gutter system works as it should. Contact Us today for a Free Estimate. Click Here.